Who doesn’t love VeggieTales? 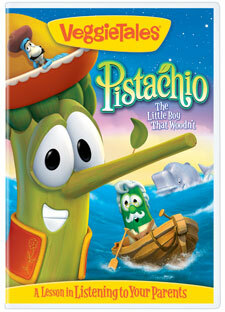 It’s been a long time since I sat down and watched a whole VeggieTales DVD from start to finish… and after watching this new installment — Pistachio: The Little Boy That Woodn’t – I’m sorry it took me this long to start watching them again! Once upon a time in the small Italian town of Bologna-Salami, there lived a lonely toymaker named Gelato and his assistant Cricket. Gelato had no children he could call his own, so one day he decided to carve a little boy out of wood. Imagine Gelato’s surprise when he learned that this little toy boy could walk… and talk… and definitely had a mind of his own! Like the little lost sheep who strays from the fold, Pistachio decides to try things his way and lands in a “whale” of a situation! Will Pistachio learn that obeying the wisdom of a loving father will help him find what he really needs and could be the key to saving his whole family from becoming fish food? Find out in this all new VeggieTales adventure with a lesson about the importance of family and listening to your parents. With the series’ trademark humor that spans generations, this latest installment in the VeggieTales franchise does what it sets out to do: entertain while teaching an important life truth. The animation is as good as always, and I particularly liked the sidekick characters: Cricket (not a cricket) and the three ducklings. Mind you, the ducklings seemed pretty random — why did the toymaker care for ducks? and how did that add to the story? it didn’t… — but they added some laughs and upped the ‘cute’ factor in general. Admittedly, I’m not sure how successful the story was at conveying its message, but I think that part is really up to the parents or caretakers afterward… this is the kind of thing I would gladly show to my friends’ kids and discuss with them afterward, in order to emphasize and reinforce the message about the importance of listening to your parents. Whether it’s for your church library, your own family, the children of friends or relatives, or even for yourself, Pistachio is a well-crafted addition to the VeggieTales library. And with a good message to boot! DVD has been provided courtesy of David C Cook and Graf-Martin Communications, Inc. Available now at your local Christian retailer. This entry was posted on Thursday, April 1st, 2010 at 1:11 pm	and is filed under Tasty Tomes. You can follow any responses to this entry through the RSS 2.0 feed. You can leave a response, or trackback from your own site. We just won a copy of this from our local Christian radio station and watched it as a family. Like you, it’s been a few years since I watched a VT video, and like you, I wonder how well the message of obedience gets across to kids. I also agree, though, that the quality and laughter level we’ve come to expect is still there, and I look forward to filling in some of my own VT gaps.